PORTLAND, Ore. — July 14, 2017 – Daimler Trucks North America announced today the opening of the first Alliance Truck Parts retail stores in Hartford, Connecticut and El Centro, California. Daimler Trucks North America (DTNA) has been working closely with a number of North American dealers to develop an Alliance Truck Parts retail store strategy to better serve the needs of small to medium size fleets and second and third owner operators. Over the past several years DTNA has made substantial investments into the ATP brand. Most notably, Alliance Truck Parts is featured on the #2 Ford Fusion, driven by Brad Keselowski, in the NASCAR Monster Energy Cup Series. “Our involvement in NASCAR over the past several years has allowed us to get ATP in front of our target customers. We have seen substantial growth in brand awareness as a result of our racing activities,” Added Finn. Alliance Truck Parts will expand its product portfolio with several new product launches this year including ATP diesel particulate filters, steel wheels, and slack adjusters being added to the product portfolio this summer. “It is all about the customer. A combination of a strong retail network, brand awareness, parts availability and well-priced quality products will allow us to service our customers more effectively. 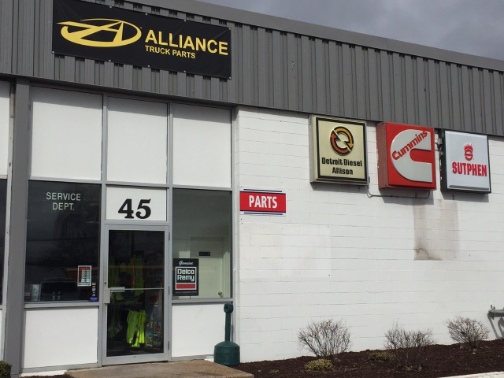 We are excited about the future of Alliance Truck Parts and the addition of the new retail centers,” concluded Finn. Alliance Truck Parts offers a range of new and remanufactured reliable parts and accessories at affordable prices to the commercial transportation industry. Alliance Truck Parts are available at more than 800 retail locations, including Freightliner, Sterling, Western Star, and Thomas Built Bus dealerships in the U.S. and Canada, as well as, TravelCenters of America and Petro locations nationwide. For more information, or to locate the nearest Alliance Truck Parts dealer, visit alliancetruckparts.com. Alliance Truck Parts is a brand of Daimler Trucks North America LLC, the largest heavy-duty truck manufacturer in North America and a leading manufacturer of Class 6-8 vehicles. Daimler Trucks North America produces and markets commercial vehicles under the Freightliner, Western Star and Thomas Built Buses nameplates. Daimler Trucks North America is a Daimler company.